Despite the enormous cardiovascular disease epidemic among maintenance hemodialysis (MHD) patients, total hypercholesterolemia seems paradoxically to be associated with better survival. It was hypothesized that similar paradoxic associations also exist for serum LDL, HDL, and triglycerides. A 3-yr (July 2001 through June 2004) cohort of 15,859 MHD patients was studied in the United States from DaVita dialysis clinics where lipid profile was measured in at least 50% of all outpatients during a given calendar quarter. Cox proportional hazard models were adjusted for case mix and surrogates of malnutrition-inflammation complex. Both total and LDL hypercholesterolemia showed a paradoxic association with better survival. Hypertriglyceridemia (>200 mg/dl) also showed a similar trend, but serum HDL cholesterol did not have any clear association with survival. The association between a low serum LDL <70 mg/dl, which was prevalent among almost 50% of all MHD patients, and a higher all-cause death risk was robust to multivariate adjustment. In the subgroup analyses, these paradoxic associations persisted among most subgroups, although they tended to be stronger among hypoalbuminemic (<3.8 mg/dl) patients and those with a lower dietary protein intake (<1 g/kg per d). However, in black patients, a high serum LDL (>100 mg/ml) was associated with adjusted cardiovascular death hazard ratio of 1.94 (95% confidence interval 1.12 to 2.38; P = 0.02). Despite inverse associations between hyperlipidemia and survival, black MHD patients with high LDL show almost two-fold increase in cardiovascular death risk. Although these associations may not be causal, they call into question whether specific subgroups of dialysis patients are better targets for cholesterol-lowering therapy. The number of maintenance dialysis outpatients in the United States, currently approximately 350,000, is expected to surpass one half million by 2010 and reach 1.5 million by 2016 (1). These individuals experience a low quality of life, high hospitalization rates, and a high mortality rate, currently >20% annually in the United States, despite many recent improvements in dialysis treatment and techniques (1). Two thirds of all dialysis patients die within 5 yr of initiation of dialysis treatment, a 5-yr survival worse than that of many cancers (1). The causes of death in dialysis patients are diverse; however, approximately half of all dialysis patients die of cardiovascular disease (1). Extrapolation of findings from the general population has led to decades of treating such conventional cardiovascular risk factors in dialysis patients as hypercholesterolemia and hypertension (2). The recent National Kidney Foundation Kidney Disease Outcomes Quality Initiative (K/DOQI) clinical practice guidelines for managing dyslipidemia (3) and cardiovascular disease in dialysis patients (4) have focused on these conventional risk factors. However, observational studies have shown either no association or a paradoxic relationship between total serum cholesterol level and survival in dialysis patients (5–8). A recent study by Liu et al. (9) indicated that these paradoxic associations are the result of confounding by the malnutrition-inflammation complex (or cachexia) syndrome (MICS) and predicted that cholesterol-lowering intervention would improve survival in dialysis patients. However, a recent controlled, randomized trial in Germany, known as the 4D Study (Die Deutsche Diabetes Dialyze Studie), showed neither survival benefit nor any harm as a result of cholesterol-lowering interventions using atorvastatin in dialysis patients with diabetes (10). The neutral outcome of the 4D Study could be because no specific subgroup of dialysis patients was identified and targeted previously with a higher likelihood of responding to cholesterol-lowering treatment. Most previous observational studies examined cohorts of dialysis patients before the 21st century and investigated the mortality predictability of total serum cholesterol only (5,6,9). The association between different classes of lipoproteins, including LDL, and HDL, or triglycerides, and death risk in dialysis patients essentially is unknown. It is not known whether these associations are similar in different subgroups of dialysis patients according to age, race, gender, dialysis vintage, and other clinically relevant categories (11). We hypothesized that the paradoxic associations that are observed between higher total serum cholesterol values and better survival also are true for triglyceride and different lipoprotein types and in different subgroups of dialysis patients even after exhaustive multivariate adjustment. We also sought to identify groups of dialysis patients in whom hyperlipidemia is associated with poor survival so that future clinical trials can target these individuals. We examined a large national database of maintenance hemodialysis (MHD) patients of the contemporary origin with somewhat uniform practice patterns and with highly standardized laboratory values that all were measured in one single laboratory. The database creation has been described previously (12–14). In summary, the data warehouse of DaVita, Inc., the second largest dialysis care provider in the United States with >600 dialysis facilities and approximately 40,000 patients at any given time across the country, includes comprehensive information on virtually all of its patients. A 3-yr cohort (July 1, 2001, through June 30, 2004) of these patients was studied. All repeated measures of every relevant variable for each patient within any given calendar quarter (13 wk) were averaged to obtain one quarterly mean value for that variable. The study was approved by institutional review committees of Harbor-UCLA and DaVita. Cohort time included the number of days a patient participated in the cohort and was a number between 1 and 1095 d. Dialysis vintage was defined as the duration of time between first day of dialysis treatment and the first day that a patient entered the cohort. Four categories of vintage were formed: (1) First 6 mo, (2) between 6 and 24 mo, (3) between 2 and 5 yr, and (4) >5 yr. The entry quarter was defined as the first calendar quarter in which a patient’s dialysis vintage was >3 mo for at least half of the duration of the given calendar quarter. By implementing this criterion, any patient who had not maintained in the cohort beyond the first 3 mo of MHD was excluded. The causes of death, obtained from the computerized database, reflecting the reported information in the Cause of Death form (Form 2746), were obtained and summarized into six main categories: Cardiovascular, infectious, gastrointestinal, cancer related, others, and unspecified/unknown. Because lipid panels were not measured uniformly in all MHD patients across the United States, a significant selection bias might have existed in that only certain groups of MHD patients who did not represent the entire patient population underwent serum lipid measurements. To mitigate this potential selection bias, we studied only MHD patients who originated from dialysis clinics in which at least 50% of all patients had serum lipid measurements in any given calendar quarter. By doing so, only dialysis clinics with uniform cholesterol measurement policies were selected for this study. Five race/ethnic groups were defined: White (including non-Hispanic white and Middle Easterner), self-described black (including African Americans and sub-Saharan Africans), Asian (including Pacific Islanders), American Indian, and others. History of tobacco smoking and preexisting cardiovascular and noncardiovascular comorbid conditions were obtained by linking the DaVita database to the Medical Evidence Form 2728 of the US Renal Data System (15). Available comorbidities included history of cardiac arrest, congestive heart failure, cerebrovascular disease, cardiac dysrhythmia, ischemic heart disease, myocardial infarction, pericarditis, and peripheral vascular disease. For prevention of unnecessary reduction in statistical significance upon multivariate adjustments, an index that consisted of five binary variables was created: (1) Any comorbidity and smoker, (2) no comorbidity but smoker, (3) any comorbidity and nonsmoker, (4) no comorbidity and nonsmoker, and (5) missing comorbidity and smoker status. In addition, the use of a catheter as the dialysis access during the given calendar quarter (yes/no) was added to case-mix models as a covariate. Patient’s postdialysis weight from each hemodialysis treatment was averaged over each 13-wk calendar quarter, and the body mass index (BMI; weight in kg, divided by height in m2) was calculated and used as a MICS covariate. Most blood samples were predialysis with the exception of postdialysis serum urea nitrogen to calculate urea kinetics. Blood samples were drawn using uniform techniques in all dialysis clinics across the United States and were transported to the central DaVita laboratory in Deland, FL, within 24 h. All laboratory values were measured via automated and standardized methods in the DaVita laboratory. Most laboratory values, including complete blood cell counts and serum levels of serum urea nitrogen, albumin, creatinine, ferritin and total iron-binding capacity (TIBC), were measured monthly. Serum ferritin was measured quarterly. Hemoglobin was measured weekly to biweekly in most patients. Lipid panels were measured quarterly to annually in most selected dialysis facilities. Kt/V to reflect dialysis dosage and normalized protein nitrogen appearance (nPNA), an estimation of daily protein intake, were measured monthly according to Daugirdas et al. (16). Nine laboratory variables were selected to indicate the nutritional state and presence of inflammation, together also known as MICS (17): (1) Serum albumin, which has strong associations with inflammation and prospective mortality in MHD patients (18,19); (2) nPNA as a marker of daily protein intake and an outcome predictor (14); (3) serum TIBC, known to have strong association with subjective global assessment of nutrition (20,21); (4) serum ferritin, a possible inflammatory marker (22,23); (5) serum creatinine, a marker of muscle mass (24); (6) peripheral white blood cell (WBC) count, which is reported to correlate with serum C-reactive protein and to predict survival in MHD patients (25,26); (7) percentage of lymphocytes in the WBC count, a known nutritional marker that was shown recently to have independent associations with mortality in MHD patients (26,27); (8) blood hemoglobin, an outcome predictor in MHD patients (13,20,28); and (9) and serum bicarbonate, which is known to correlate with survival (29). In addition to standard descriptive statistics, Cox proportional hazard regression for truncated and censored data were used to determine whether all-cause or cardiovascular mortality was associated with baseline categories of cholesterol, LDL, HDL, or triglycerides. Reference categories were chosen on the basis of clinically relevant guidelines or because they were the modal category or adjacent to the modal category with similar sample size or event rates as the modal category to allow for most powerful analyses. For each analysis, three models were examined on the basis of the level of multivariate adjustment: (1) Unadjusted model included lipid categories and mortality data as well as the entry quarter indicators; (2) case-mix–adjusted models also included age, gender, race and ethnicity, diabetes, vintage categories, primary insurance (Medicare, Medicaid, private, and others), marriage status (married, single, divorced, widowed, and others), standardized mortality ratio of the dialysis clinic during entry quarter, comorbid conditions and tobacco smoking, residual renal function during the entry quarter (Kru), and the Kt/V (single pool); and (3) Case-mix–and MICS-adjusted models included all of the previously mentioned covariates as well as 10 indicators of nutritional state and inflammation, including nPNA and serum albumin, bicarbonate, TIBC, ferritin and creatinine, WBC count, lymphocyte percentage, hemoglobin level, and BMI. Missing covariate data (<5%) were imputed by the mean or median of the existing values. All descriptive and multivariate statistics were carried out via SAS, version 9.01 (SAS Institute, Cary, NC). The original 3-year (July 2001 through June 2004) national database of all DaVita MHD patients included 102,255 cumulative patients. After deletion of MHD patients who did not maintain beyond 3 mo of hemodialysis treatment (13,657 patients from the first 11 quarters and 5348 patients from the last quarter), 83,250 MHD patients remained for analysis, 291 of whom had missing data. The resulting cohort included 82,959 MHD patients (Figure 1). From this cohort, only dialysis clinics in which at least 50% of patients had lipid measurement were selected, in an effort to reduce selection bias by indication. Of the 614 clinics, 215 had at least one quarter in which this criterion was satisfied, leaving 29,127 MHD patients in an eligible clinic. Of these, 15,859 individuals had a serum lipid value in an eligible calendar quarter. These individuals constituted the cohort used in further analyses. Selection process of the study population. MHD, maintenance hemodialysis; pt, patient. Table 1 shows baseline demographic, clinical, and laboratory characteristics of the main cohort as well as the subset of patients with total serum cholesterol and LDL measurements. Of note, serum albumin was 0.10 g/dl higher is patients from dialysis facilities where serum lipids are measured in >50% of the patients. Table 2 shows the correlation coefficients among lipid measurements and other clinical and laboratory parameters. Among lipids, serum triglyceride had the strongest association with the BMI. Tables 3 and 4 show the a priori selected categories of total serum cholesterol and LDL, respectively. Both crude all-cause and cardiovascular mortality tended to be higher in lower serum lipoprotein values, which could be related at least partially to MICS, because serum albumin tended to be lower in these groups. Figures 2 and 3 show the hazard ratios (HR) of all-cause mortality for the aforementioned total cholesterol and LDL categories over a 3-yr period (July 2001 through June 2004). The lowest cholesterol groups (<95 and 95 to 109 mg/dl) were associated with the highest mortality at all three levels of adjustment, although the multivariate adjusted models reduce the magnitude of the relative death hazard. Having a total cholesterol value <110 mg/dl was associated with a significantly increased mortality HR even after exhaustive multivariate adjustment for case-mix and MICS surrogates. 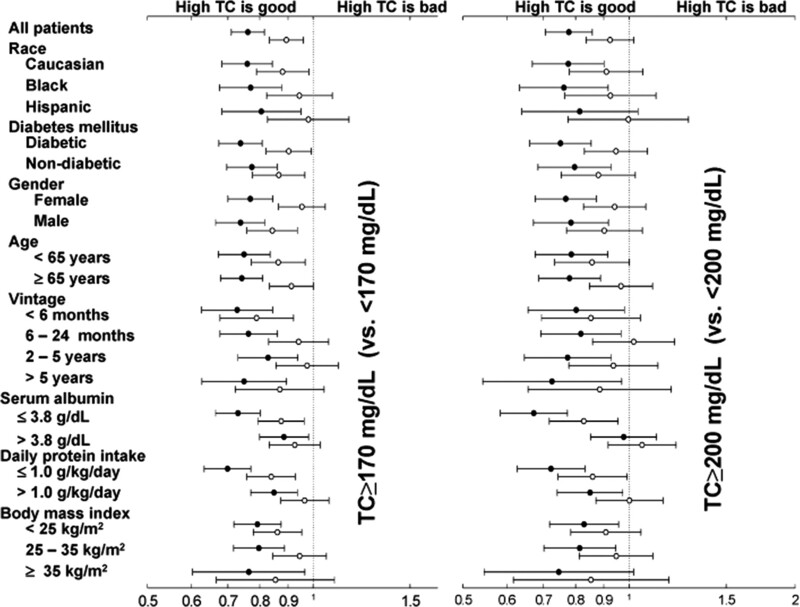 The best survival was observed for total serum cholesterol values between 225 and 254 mg/dl at all levels of adjustment. A similar trend was observed for LDL, in which the two lowest categories are associated with the highest mortality hazard. Multivariate adjustments demonstrate very similar estimates of effect as the unadjusted model. Cardiovascular death HR also are shown, which were similar to all-cause mortality. 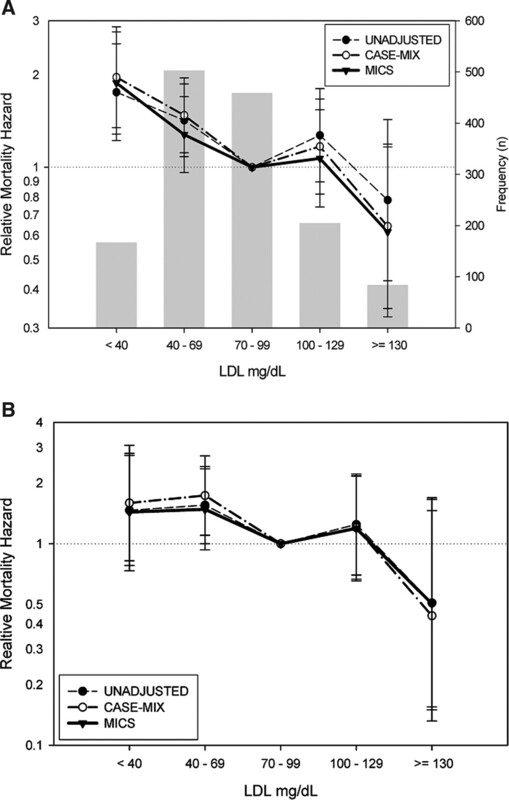 As shown in Figure 3, the mortality predictability of serum LDL is nearly strictly decreasing. It seems as although the set of MICS surrogates is less able to explain this association. 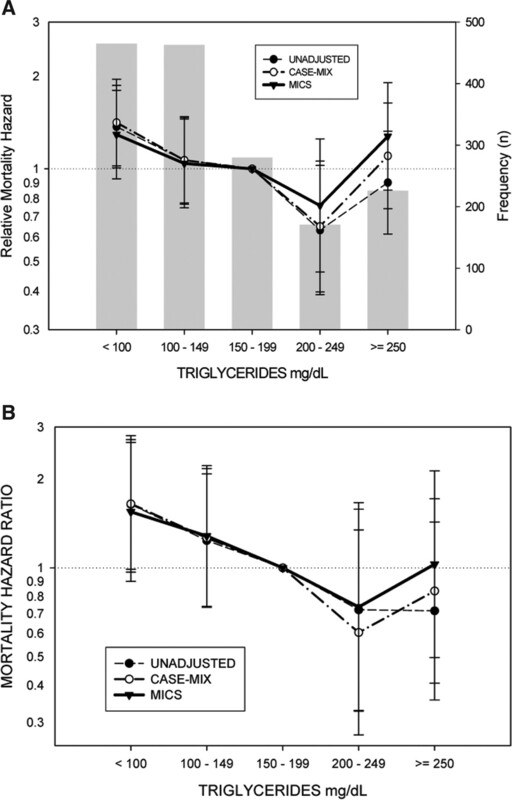 Figures 4 and 5 show similar analyses for the a priori selected categories of serum HDL and triglycerides. No notable trend of mortality predictability was noticed for serum HDL, although serum triglyceride level tended toward better cardiovascular survival at moderately high levels (200 to 250 mg/dl). Table 6 shows the HR for the continuous (noncategorized) serum lipid values. All HR are <1, indicating paradoxic trends between higher serum lipid values and better survival in MHD patients in sharp contradiction to that seen in the general population. Hazard ratios (HR) of all-cause (top) and cardiovascular (bottom) mortality for total serum cholesterol categories in 15,859 MHD patients who were observed for up to 3 yr. The upper panel also includes patient frequencies in the form of a bar diagram in the background. See text for the list of covariates at each level of multivariate adjustment. HR of all-cause (top) and cardiovascular (bottom) mortality for serum LDL categories in 1418 MHD patients who were observed for up to 3 yr. The upper panel also includes patient frequencies in the form of a bar diagram in the background. See text for the list of covariates at each level of multivariate adjustment. HR of all-cause (top) and cardiovascular (bottom) mortality for serum HDL categories in 1418 MHD patients who were observed for up to 3 yr. The upper panel also includes patient frequencies in the form of a bar diagram in the background. See text for the list of covariates at each level of multivariate adjustment. HR of all-cause (top) and cardiovascular (bottom) mortality for serum triglyceride categories in 1418 MHD patients who were observed for up to 3 yr. The upper panel also includes patient frequencies in the form of a bar diagram in the background. See text for the list of covariates at each level of multivariate adjustment. Figure 6 shows the association between hypercholesterolemia (dichotomized at serum total cholesterol levels of 170 and 200 mg/dl) and death risk in different subgroups of MHD patients. In almost all subgroups, hypercholesterolemia showed a tendency toward better survival. However, the association mitigated upon multivariate adjustment for case-mix and MICS surrogates. Of note, the paradoxic association between hypercholesterolemia and better survival was more notable among those with hypoalbuminemia (<3.8 g/dl) or a low dietary protein intake (<1 g/kg per d) than higher values. Figure 7 shows the association between LDL hypercholesterolemia (dichotomized at serum LDL levels of 70 and 100 mg/dl) and death risk in the same subgroups of MHD patients. Similar trends indicating paradoxic associations between high LDL values and better survival were observed, with the notable exception of black MHD patients, in whom an LDL hypercholesterolemia (>100 mg/dl) was significantly associated with a higher death risk (unadjusted HR 1.49 [95% confidence interval 0.92 to 2.43; P = 0.11]; multivariate adjusted death HR 1.94 [95% confidence interval 1.12 to 2.38; P = 0.02]). HR of all-cause mortality for two selected dichotomized levels of total serum cholesterol (left: 170 mg/dl; right: 200 mg/dl) in selected subgroups of 15,859 MHD patients who were observed for up to 3 yr. See text for the list of covariates in the multivariate (case-mix and malnutrition-inflammation complex syndrome [MICS]) adjusted models. TC, total cholesterol. 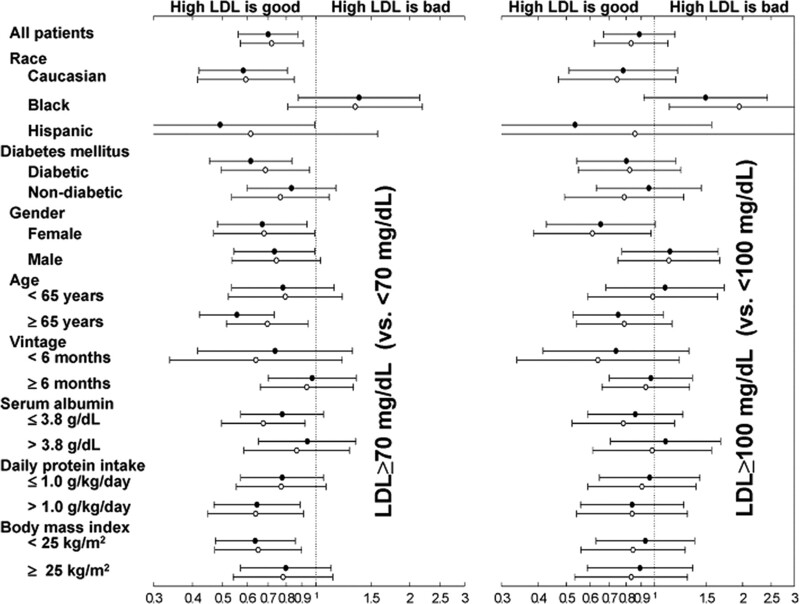 HR of all-cause mortality for two selected dichotomized levels of serum LDL (left: 70 mg/dl; right: 100 mg/dl) in selected subgroups of 1418 MHD patients who were observed for up to 3 yr. See text for the list of covariates in the multivariate (case-mix and MICS) adjusted models. Examining a large 3-yr cohort of MHD patients across the United States in the 21st century, we found that not only total hypercholesterolemia (>200 mg/dl) but also LDL hypercholesterolemia tends to show a paradoxic association with better survival. Hypertriglyceridemia (>200 mg/dl) also showed a similar trend, but serum HDL cholesterol did not have any clear association with survival. The association between a low serum LDL <70 mg/dl, which was prevalent among almost 50% of all MHD patients studied here, and higher all-cause death risk was robust to multivariate adjustment for case-mix and MICS surrogates. In the subgroup analyses, these paradoxic associations persisted among most subgroups, although they tended to be stronger among hypoalbuminemic MHD patients (albumin <3.8 mg/dl) and those with a lower dietary protein intake (nPNA <1 g/kg per d). The notable exception were the black MHD patients, in whom a high LDL cholesterol (>100 mg/ml) was associated with almost two-fold increased cardiovascular death risk during the 3-yr period, a so-called “paradox within paradox” (Figure 7). This finding is not consistent with our original hypothesis, according to which the paradoxic association between hypercholesterolemia and better survival should hold in all different subgroups of dialysis patients even after exhaustive multivariate adjustment. Several studies have indicated an unexpected association between low serum total cholesterol and poor survival of dialysis patients (5–7). Survival selection may have played a role in causing these so-called reverse epidemiology phenomena in dialysis patients (30), especially because most individuals with chronic kidney disease (CKD) die before reaching the dialysis stage (31). Moreover, the strong survival bias that continues to exist even within the dialysis patient population may confound such associations significantly, because >20% of dialysis patients die each year in the United States (1). Even though we have controlled for dialysis vintage and a range of risk factors, some unknown confounders, including the survival bias, can hardly be adjusted for. Therefore, the “mortality cross-over” pattern could be a result of this type of bias (32,33). Nevertheless, our findings pertain only to dialysis patients and not the entire CKD population. An innovative observational study by Liu et al. 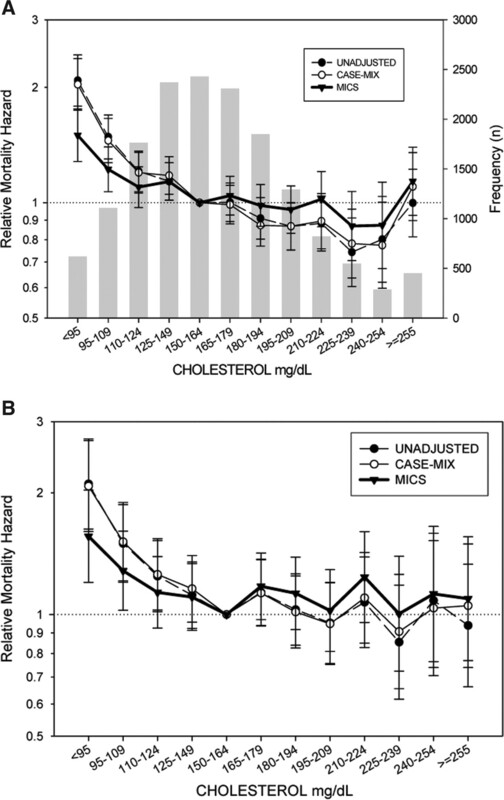 (9) showed that MICS leads to the inverse association between cholesterol and mortality in these patients. However, in the small and relatively healthy sample (n = 823) studied by Liu et al. (9), only less than one quarter of patients (n = 189) were classified as not having MICS (34). It was not clear how the risk-outcome constellation of 23% of this cohort without MICS was generalized to the rest of the MHD patients with MICS to infer that hypercholesterolemia was associated with poor outcome in dialysis patients (34,35). In the 4D Study (10), 1255 dialysis patients with diabetes were randomly assigned to receive either atorvastatin 20 mg or placebo for 5 yr. The study recently was reported negative (10) because only a nonsignificant 8% reduction of the primary composite end point was observed after 41% fall in LDL cholesterol by atorvastatin independent of prevailing LDL cholesterol. Such an association suggests that lowering LDL in this population not only does not cause any harm but also may even be useful if a more responding subgroup of dialysis patients such as black patients undergo the intervention. This was in distinct contrast to the recently published Collaborative Atorvastatin Diabetes Study (CARDS) (36) in patients who had type 2 diabetes and had not yet developed significant kidney disease. In that study, atorvastatin reduced the rate of acute coronary events by 36%, coronary revascularization by 31%, stroke by 48%, and death by 27%. The 4D Study investigators concluded that their negative results might have been due to the advanced cardiovascular diseases in the MHD patients and that the statin therapy was initiated too late (10). Despite the striking cardiovascular disease epidemic in dialysis patients, hypercholesterolemia is not a common condition in these individuals. A recent matching study showed that high serum total and LDL cholesterol levels are relatively uncommon in MHD patients when compared with other morbid populations (37). In our cohort, almost half of all MHD patents had an LDL value <70 mg/dl, and these individuals indeed were MHD patients with the highest all-cause and cardiovascular death rates (see Table 4 and Figure 3). Similar to dialysis patients, the relationship between cholesterol and clinical outcome in patients with congestive heart failure (CHF) is a paradoxical one (38–42). Comparing the studies on dialysis patients and patients with CHF, the reverse epidemiology of hyperlipidemia in heart failure seems to be supported by a higher number of independent studies, whereas the observational lipid studies on dialysis patients have larger sample sizes (30). Moreover, heart failure studies include all classes of lipid panels, whereas the bulk of data in dialysis patients are restricted to the reverse epidemiology of total cholesterol. Rauchhaus et al. (43) advanced the endotoxin-lipoprotein hypothesis, which suggests that lipoproteins can bind bacterial toxins and thereby have anti-inflammatory effects if bacterial toxins indeed are of relevance in the pathophysiology of CHF-associated inflammation. Recently, the same group also provided evidence from ex vivo studies that higher cholesterol levels related to lower cytokine production in whole blood that was exposed to endotoxin (44). An interesting finding of our study was the unexpected but seemingly conventional association between high LDL cholesterol level and cardiovascular death among black MHD patients (Figure 7). If verified in other studies, then this so-called “paradox in paradox” or “reversal of the reverse epidemiology” (30) may have important clinical and public health implications; disparities in income, education, diet, lifestyle, comorbid conditions, and access to health care are implicated in the higher total mortality in black patients than in non-Hispanic white patients (45–47). In sharp contrast, black MHD patients have a much lower annual mortality (18%) than white patients (28%) (48), which may play a role in differential survival and other disparities in the presence of unmeasured confounders such as nutritional factors (30). Our study should be qualified because it is observational, rather than interventional, and because a mixed incident/prevalent MHD population was examined. However, we adjusted for dialysis vintage in all case-mix models and also performed separate analysis for incident (vintage <6 mo) dialysis patients as shown in Figures 6 and 7. A limitation of our study is that the potential confounding of therapy with cholesterol-lowering agents was not examined because home medication data are not available systematically in such national cohorts. However, given the negative results of the 4D Study (10), it is highly unlikely, although not impossible, that the inclusion of such data would have resulted in significantly different associations. Our studied cohort represented only 18% of the entire national DaVita database for total cholesterol analysis and even smaller fractions for lipid subgroup analyses, because we studied only MHD patients whose dialysis facilities measured lipid profiles in at least 50% of all patients (Figure 1). This approach was used to mitigate the selection bias by indication. However, it is important to underscore the potential for introducing new sources of significant selection bias via the foregoing method. The analysis of serum lipid data should be viewed as only exploratory. Although interesting and clinically relevant findings of preliminary utility can be derived from these results, patient data were present for only a very small percentage of eligible patients. Therefore, even though our selection method (Figure 1) was used in an effort to reduce confounding by indication present in lipid associations, such selection processes as ours may allow for potentially significant and undetermined bias. Nevertheless, all DaVita dialysis facilities were under uniform administrative care, and all laboratory tests were performed in one single laboratory with optimal quality-assurance monitoring. Furthermore, we used 3-mo averaged measures rather than one single measure at baseline, and we adjusted for dialysis vintage in all multivariate models. Another limitation of our study may be lack of explicit laboratory markers of inflammation such as C-reactive protein. We did use data on serum albumin, ferritin, and TIBC, and WBC and lymphocyte percentages tend to vary significantly with inflammation (20–23,25). Another limitation of our analysis is that it is based on only a 3-yr follow-up, rather than longer period of observation, and so may not apply to long-term survival. Nonetheless, two thirds of MHD patients die within the first 5 yr of initiation of dialysis (49). The narrow time window of our study ensures that confounding by changes in practice or technology is minimal. Although these paradoxic associations seem to be somewhat consistent, black patients display a more conventional association between LDL hypercholesterolemia and increased death risk. Therefore, cholesterol-lowering therapy might be more promising if this or similar subgroups of MHD patients or patients with CHF are targeted (3). The seemingly negative results of the 4D Study (10) should not discourage investigators from conducting more randomized trials with specific subgroups of patients in mind. The so-called reverse epidemiology observations should not be considered causal or lead to the nihilistic conclusion of no clinical benefit from cholesterol-lowering therapy. Following the same logic, it should not be concluded that if for a certain group the association of hyperlipidemia with poor survival is found in observational studies, then only that group would benefit from lipid-lowering interventions. Studies to identify unique characteristics of distinct subpopulations of MHD patients and patients with CHF and more clinical trials on the effect of cholesterol-lowering interventions on CKD survival (50,51) are urgently needed. C.J.M. is an employee of DaVita, Inc. This study was supported by research grants from the American Heart Association (0655776Y), the National Institute of Diabetes and Digestive and Kidney Diseases (DK61162), and Philanthropist Harold Simmons. This study extends the paradoxical association of higher cholesterol levels with improved survival in dialysis patients to show similar results with LDL cholesterol and triglycerides. However, although low LDL is associated with a higher risk of cardiovascular disease overall, in blacks high LDL increases cardiovascular risk two-fold. The study is linked to the study by Bradbury et al. in this month’s issue of CJASN (pp. 89–99), which utilizes data from the DOPPS study to define the factors that predict early mortality in the first 4 months after transplantation and document the benefit of predialysis care by a nephrologist who can identify and modify these risk factors.